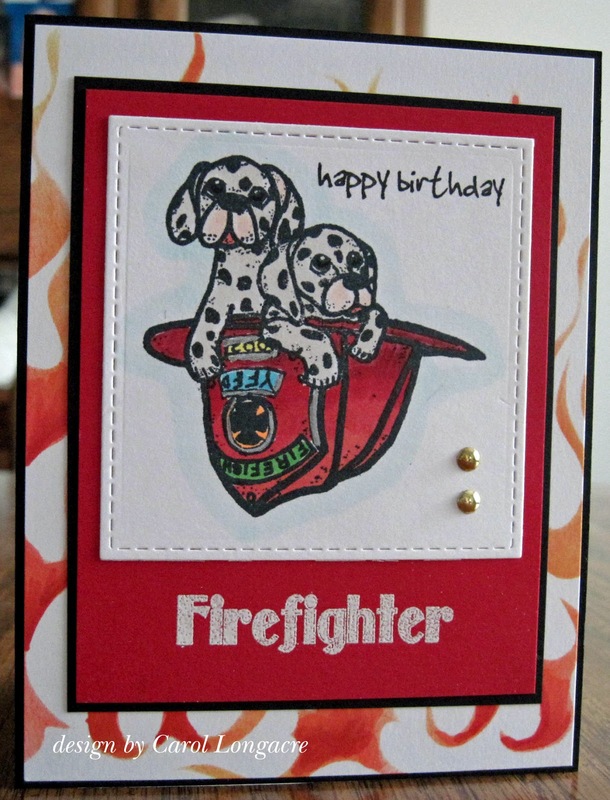 While rummaging through my stash, I found this forgotten MFP (store now closed) firefighter stamp set and set out to make a card with it. I colored the image with Copics and die-cut it with a GMD stitched square die, placing it on a red panel where I heat-embossed the sentiment with white ep. I matted that with black and placed it on top of a stenciled background, done with a TCW flames stencil and some red, orange and amber inks. For the final touch, I added 2 mini gold brads and stamped a birthday sentiment at the top. The inside reads "You are my Hero!" I'm sharing this over at the 2 Crafty Critter Crazies challenge for May #14 where all you have to do is add a critter to your card. Rain or shine, have yourself a wonderful Sunday and thanks for stopping by! Really a cute, cute image and I love your card! Your coloring on that hat is sensational too. Love your card Carol. Hope that sun keeps on shining for you now! This is too funny! I just saw the pic of the card I made when I borrowed this set from you. It is a great set! I remember the lady I made it for being so thrilled I had something. What a fun card, Carol! Beautifully colored! Yep that is a warm sun, maybe we will finally get my flower beds ready. A super card Carol, such an adorable image. An absolute delight, a wonderful image, beautifully coloured, a Super card. That is so super cute and adorable. Great coloring too! Fun and lovely card Carol, so different. 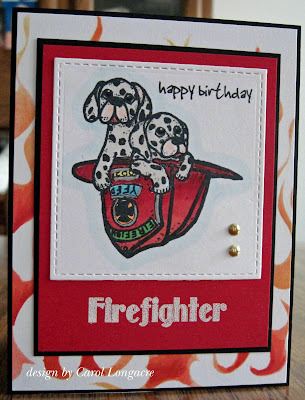 I have never seen this stamp, but that doggie is so cute in the fireman hat!! The stencilled background with the flame is very appropriated!! Well dne! Great image, Carol. I like your card design!